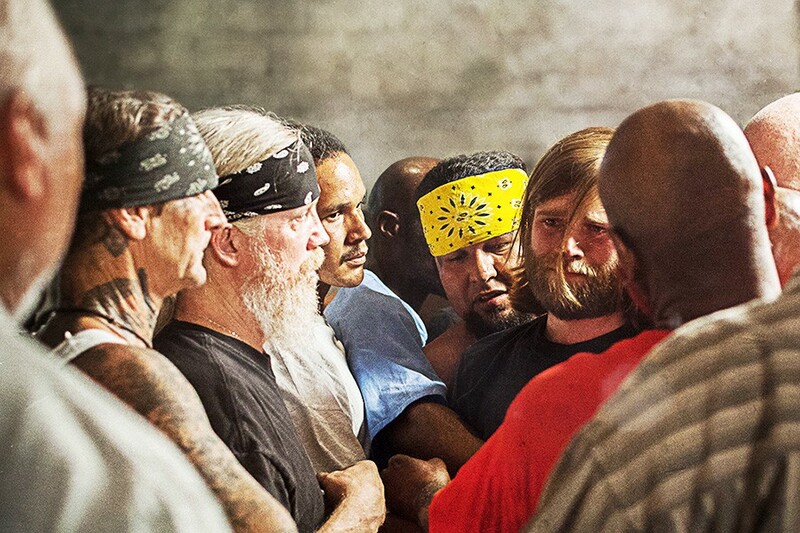 No film this year better illustrates that principle than a remarkable 89-minute documentary about a bunch of guys sitting around a circle in a prison. The Work, which just became available on digital and on-demand platforms, brings us inside a little-known group-therapy project known as the Inside Circle Foundation, which pairs inmates with civilians for an intense four-day session. Shot in 2009, The Work introduces us to three men from the outside who volunteer for the program: a middle-aged father named Charles; a shy, bearded museum worker named Chris; and a cocky young teacher’s assistant named Brian. Soon, they’re inside Folsom Prison next to convicted killers and gang members, all of them talking about their problems and offering a supportive ear to each other. And then, something incredible happens — and keeps happening. One by one, these men, whether prisoners or civilians, start experiencing raw, emotional breakthroughs. Seemingly stoic men break into tears. Wails of anguish erupt out of nowhere, as if the subjects are going through an exorcism. Men get eye-to-eye with one another, their faces so close that they could kiss. Slowly but surely through the program’s guided therapy, which is referred to as “doing the work,” the film’s subjects tap into deep psychic wounds that activate visceral, almost uncontrollable outbursts. And in the process, the line between these seemingly very different men gets erased — all of them caught up in this shared, intimate expression of unfiltered pain. Even those who are leery of group therapy and other progressive therapy programs — and I certainly was before watching The Work — may be startled by how moving and cathartic these sessions turn out to be. Earlier this week I spoke with McLeary about how he chose the civilians for his documentary; why prisoners have more at stake than those on the outside, and what the film has to say about our national conversation regarding toxic masculinity. The film is a real family affair because your father and brothers worked on it with you as producers. But I’m curious: How did your dad introduce you to this world? My dad was a clinical psychologist. There were four guys who originally started [the program], and one of them was Rob Allbee. He met my dad while they were doing one of these trainings on the outside. Rob was trying to pull guys from the outside to go [inside], and my dad was one of the first guys asked. My dad was basically doing this sort of work all over the world. He worked with everyone from Native American tribes to companies and CEOs. Before I saw The Work, I was skeptical. I remember all those Iron John groups from the 1990s where men sat around in a circle and beat drums. This type of work can feel pretty clichéd and New Age-y. Yeah, the mythopoetic men’s movement, with Robert Bly and Joseph Campbell and all those guys. And there’s the New Warriors and the Mankind Project. Some of these things kind of feel like boutique seminars. There’s a lot of it that I found hokey. But I’ve been doing [Inner Circle] for a while. There was enough there that worked where I couldn’t throw the baby out with the bathwater. And what I did see is that some of those things that I thought were hokey were exactly what worked for some people. In the film, they do a guided seminar with music — I find that to be hokey, and they don’t work for me. But the reason we kept it [in the film] is because a lot of guys on the inside find that this stuff works for them. Throughout the four days, there’s a grab bag of stuff. They’re shameless in their borrowing from different disciplines — Jungian psychology and initiatory stuff and whatever. Everything you see them doing, it’s because it works for some people. What was your own first session like? And when did you know you wanted to make a film about this? I volunteered in 2001, and I just kept going back because of what I saw taking place in that room. It was just the purest interface of humanity I’d ever seen. There’s an intensity and urgency that takes place because they’re in prison. There were, like, three other guys who tried to make a film, and for whatever reason, they just stalled out at different points — they never got to a point where they actually shot anything. And I was working in the entertainment industry in L.A. at that point. I wanted to do narrative films. But I just became obsessed with the idea of shooting this documentary. So in 2006, I was just like, “Okay, I’m gonna do it.” I called Rob, and it took him about a year to finally say yes. At that point, I asked my brothers and my father to help, and we started to talk to the inmates. Was Rob concerned about having cameras in the room and how that would affect people’s behavior? Their concerns were mainly focused on not exploiting themselves or the program. They wanted to protect the program. [The program] was completely confidential; it was totally off the map; and nobody knew about it. The prison administration allows it to happen, but they’ve never been inside that room to really know what was going on — they just knew that it had results, and until there was some sort of altercation, they would allow it to keep happening. Our concern was: Would we extinguish the very thing that we were trying to capture? It’s remarkable how intimate The Work is. We’re right there in the circle alongside these men. How did you get to a place where people felt comfortable with your cameras? We had three cameras. One was on a tripod, which would capture a wide-angle shot. Then we had an A camera and a B camera [for close-ups]. We even had [the cameramen] dress in black to be more unassuming. We didn’t want to get too close, because we didn’t want to disturb “the work,” but within the first hours of the first day, we realized the cameras weren’t bothering them. We just kept getting closer and closer — we wanted to have it close and intimate so that we could potentially put the viewer as close to the circle as possible. But there also were times where the guys [inside the circle] determined how this was gonna go. There were times when they would point at the [cameraman] and tell him to put down the camera and to sit down and have him talk [inside the circle]. There were times where they would put all the crew at the center of the circle so everyone could see them and do an exercise. That was happening throughout the course of the whole weekend. Whatever they needed to be comfortable, that’s what we did. In the film, we hear from those on the outside about what they’re looking to achieve. When you started doing the program, was there something you were seeking? I just knew that this kind of introspection gave me knowledge about myself and about other people. It makes me sharper, and the more I can move obstacles internally out of my way, the more effective it makes me. But I’ve never been a fan of paid therapy, because it seems too dry and too clinical, and the other person isn’t doing the stuff with you. They’re just using certain textbook knowledge. But if you sit down and you’ve got 10 people there [like in Inside Circle], anything can happen. It gave me a level of experience and literacy when it comes to other human beings. I always found that really valuable. These three guys from the outside, you knew them all pretty well. How did they get involved in the film? Charles was our local bartender. Chris was a friend of both of my brothers. And Brian had gone to high school with us. They were guys just like the other 10 to 15 people that I’ve brought in there. We’d talk about it to, like, 10 people, and maybe one person would go. It just so happened to be that there was a film associated with it when these three guys came. Because you knew them, did you have an inkling about the kinds of visceral breakthroughs they would have on camera? We did extensive pre-interviews with those guys. So we knew maybe what different things they might get into. Interestingly, they didn’t really get into those things. [Laughs] It’s so organic — you put all these people into a room, and one person’s work affects the other person’s work, so it’s impossible to know how these combinations of individuals are going to work. It just so happens that one of the big themes on this weekend was fatherless sons, so it just kind of kept coming back to that. I imagine that father-son dynamic springs up a lot in those four-day sessions. Really, when you start talking about things that bother you, your parents are probably going to be at the top of your list. [Laughs] Or your family. They talked about a lot of that stuff in those pre-interviews, and there was a lot of stuff that they didn’t talk about, because at that point, they weren’t as comfortable or vulnerable yet. That’s one of the things that the weekend does — it makes you more vulnerable than you’re used to being in real life. I was amazed how quickly those on the outside and the inside started to bond. I would’ve guessed guys on the outside would be freaked out about hanging around with inmates. It’s always scary at first, because you have to walk through the yard — there are guards and towers and all this scary stuff. Also, even if you tell somebody how the weekend might go, there’s a judgment that’s almost impossible to get rid of — which is that [the guys on the outside] assume that they’re going to do more for the guys in prison. [They assume that] the mistakes the guys who are in prison made means that they’re missing something. Yeah, the prisoners are actually the ones who sorta lead the sessions — they’re helping the civilians more than the other way around. [The prisoners] sit in these groups every week for five, ten or fifteen years, and they become really good at doing this kind of work. They also have to read people to survive prison. So they’re natural masters at this kind of stuff. And there’s usually a shock when [those on the outside] realize that these guys are going to start helping you. [The prisoners] have been operating in these groups for as long as they have, and they’ve settled on a format over the course of the four days that’s designed to get you to trust each other very quickly and to suss out whatever your problems are or whatever it is in your life that may be blocking you. There are certain recurring problems that people have — or habits they wish they can change — and those things often come to the surface quickly. It’s impossible to watch The Work and not think about how it tackles issues of masculinity head-on — specifically, the challenge of expressing emotion. For instance, I was struck by how much crying happens in your film. We’ve shown this film in many parts of the world, and it’s pretty much the same everywhere: Dudes are conditioned to not express themselves. Don’t cry! It’s embarrassing and weak. You want to be strong and independent, and you want to stand on your own two feet. We are all like that — it doesn’t matter if it’s here or in the Netherlands or in South Korea. That [attitude] is what the guys from the outside bring, and the guys on the inside have had that as well — but the added dimension for them is that they’ve gone years without expressing their full range of emotions. In prison, to cry and to be vulnerable are signs of weakness — to the point where someone will take advantage of you or harm you physically. So that room has become an oasis for them. We have these emotions — happy, sad, angry, shame — and a normal range of human experiences is to feel those things when they happen. In the film, one of the prisoners, Kiki, gets a death notice for his sister. In prison, it’s very common that you’ll get a death notice, and there’s nothing to do with it — you can’t show [emotion]. There are too many people in prison. You can never be alone, and everybody is always watching someone else. And so what happens is that a lot of those guys will say that they forget how to feel emotion, because the only one that’s acceptable is rage. I always found it so amazing that with Kiki, there was almost this process of trying to get the body to remember how to [express emotion]. If you haven’t done it for 15 or 20 years, you lose touch with it and a sense of how to do it. That makes me wonder: What’s the risk for the inmates to take part in this program? Surely, the rest of the prisoners must know that they’re going to these sessions. Absolutely. The things that you’re learning how to do in that room are the opposite of what’s going to help you survive and be successful in prison, and to make it through on a day-to-day basis. I didn’t actually know this until Dark Cloud, one of the film’s prison subjects, was out, but his gang saw that he was becoming soft. [After being in the program], these guys naturally start to want to pull away from being aggressive and violent, and his gang needed him to be violent to protect them in prison. They told him to stop going because he was becoming weak. He told them he wasn’t going to stop, and he was jumped and stabbed eight or nine times. He went to the infirmary, but he said he’d rather die with integrity than continue to live how he was living. So there’s danger, but the reason why this works is that what happens in that room is completely confidential. That’s why no guards are in the room — they don’t want anything that happens in that room to get back into the yard. But the guys who started it are the shot-callers — they’re the leaders of each of these gangs, and they get leeway. They vouch for the program and tell the others that it’s okay and to leave it alone. There’s a balancing act that takes place that’s been successful for 20 years. You shot this in 2009. What took so long to get it out to audiences? We needed financing to finish it. There’s no way to explain this [program] unless you see it. And so, when we were trying to pitch it and explain to people why, after the recession, they should give us money, all they could think of was Scared Straight. A lot of people were like, “We’ve already seen that. If you want us to come on board and give you money, you’re going to have to take creative direction from us.” We didn’t want to change what we were doing, and we didn’t want to give anyone artistic control over it — it was too important. It’s amazing, because the film feels like it’s perfectly timed for our current moment when there’s so much talk about toxic masculinity. We thought the perfect time to [release] it would be when Obama was in office — he was the first president to go inside a prison and actually talk to the inmates. Unfortunately, that didn’t happen. But now we have Trump, and you can’t open your laptop and look at the news without seeing men being embroiled in bad conduct and dishonesty and using their power to take advantage of people. Unfortunately, I think the timing is perfect, because every time we go to one of these screenings, this is already in the air in the conversation. Really, the answer [to toxic masculinity] seems to be … it can’t just be about these sexual situations and sexual misconduct. It can’t just be women calling out dudes. It’s got to be dudes who work with other dudes to make better men. To me, that seems to be the only antidote for this stuff. Dudes need to work together to raise their level of awareness about their behavior. And if these guys can do it inside a prison — in one of the harshest environments — I don’t think men out here have any excuse. There have been recent documentaries, like 13th, that have focused entirely on America’s mass incarceration problem. Did you conceive The Work as a film about prison? We wanted to make a film about people. I know that the backdrop is prison, and the backdrop happens to be visual stereotypes of prison men having tattoos and [being] big guys, but I think it’s just about humanity. When I go to these screenings, I see men and women from all different backgrounds, and I can see that they relate to the men that they saw in the film. They may not have thought that was possible beforehand. You can feel their emotions while watching it. That’s what we were trying to do — to get beneath this exterior layer, and to get beneath people’s judgment. It’s almost like a misdirection, because what you see is that there’s a common basic denominator of human emotions, and that’s what we were trying to get at. I care about these guys, and I care about the program — I wanted to raise the level of awareness of what these guys were trying to do, and how that can help men from the outside. Mass incarceration is a massive problem. And there are many different factors involved in it, but you have these private citizens who are working directly with the guys in prisons to pick up their individual piece of what’s essentially a much larger problem. Watching the movie, I had to admit: I wondered what would happen if I did one of these weekends. I’d say that at least one person at every screening asks if they can come inside. But every one of these circles is completely different — there are different people, and different issues naturally rise to the surface. But they’re all the same in that those things will always happen — if you come in, everybody does work, and everybody has some form of a breakthrough. If you come in for the first time, you don’t just come in and sit and watch and think that it was nice. You do something, and the work is geared to naturally allow that to happen.